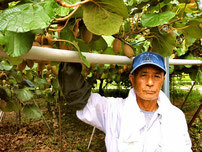 Kawami Farm, located near Saijyo City in Ehime Prefecture, rests in the foothills of Mt. Ishizuchi, the highest mountaion in western Japan. Saijyo City is blessed with pure water, a gift from Mt. Ishizuchi called "Uchinuki". 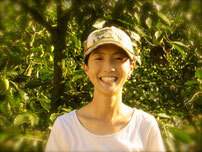 On the farm we grow fruit (persimmon, orange, Japanese Iyokan, gold kiwi) in a beautiful, natural location. The view from Kawami Farm is just stunning. Come see the gorgeous mountains, feel the fresh air and taste our luscious fruit (click here). 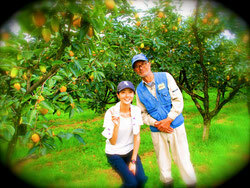 We plan to directly sell the fruit from next to the persimmon orchard at the farm (starting from in November), so if you live close to Kawami farm, please visit us anytime. We offer our products at an affordable price. Born the eldest son of a practical farmer in Saijyo in 1926. After fraduation from Tokyo University of Agricuture, he visited Israel and studied in a kibbutz (agricultural community settlement) for 3 years. After that, he married my mother in London, stayed there for a year and they came back to Japan when he was 27. He has been running Kawami Farm ever since. He is always droll and loves Israel, but sometimes he is stubborn. But he is always honest about growing fruit. I am the youngest daughter of Yasuhiro Kawami and I manage this website. I have always been interested in the world and English since I was very little. I think it's because of my parent's experience when they were young. I took a year off from university and went to Australia when I was 20 years old. I had many experiences there such as studing English, traveling alone with my backpack, hitchhiking, rough sleeping, and working in diffrent country areas. I came back to Japan and returned to school a year later. After graduation, I worked at an office using my English skill. Farming was always around me but I never imagined that I would be working on a farm as I am today. I just started recently and don't really know anything. I would like to learn all I can about farming, especially organic farming. It is my fervent wish to make people happy through farming. Thank you. How to purchase our product. This page will be prepared. However if you would like to order our fruits, please send us message from here. We will give you details how to purchase fruits and will sell them with low price.